Our background photo, beginning on my birthday, Jan 11, was chosen to reflect an increased awareness of the environment and global sustainability many students in the US have today, thanks to excellent environmental literacy programs in many schools. Maryland was one of the first states to change the K-12 curriculum across the state to require a greater understanding of environmental issues on the part of high school graduates, as we reported last year. The Environmental Literacy Council is an independent nonprofit made up of scientists, economists, and educators striving to connect teachers and students to science-based information on environmental issues. The organization’s website offers more than 1000 pages of background information and resources on environmental topics, along with curricular materials and textbook reviews. The Children’s Environmental Literacy Foundation seeks to make sustainability education an integral part of every school’s curriculum and culture, from kindergarten through high school. Their approach, explained on their website, is comprehensive. It engages students, teachers and administrators, parents, communities, and businesses through professional development, consulting services, and experiential programs. Michigan State University has an excellent environmental literacy project, the goal of which is to develop learning progressions leading toward environmental science literacy—the capacity to understand and participate in evidence-based discussions of socio-ecological systems and to make informed decisions about appropriate actions and policies—for students from upper elementary school through college. One of the four prongs of the MSU program is to prepare students to become better environmental citizens in both private (e.g., learner, consumer, worker) and public (e.g., voter, advocate) roles. 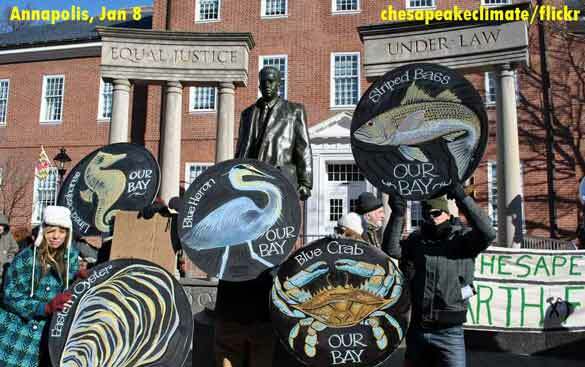 The group in the picture traveled to Maryland’s state capital, Annapolis, to protest on the opening day of the legislative session for the state’s General Assembly. Environmentalists in the group are concerned about shale gas drilling in Maryland and the possible harm it causes to the Chesapeake Bay and associated ecosystems. They thought they’d try once again for a legislative moratorium on “fracking,” as the controversial technique of hydraulic fracturing is called, the Baltimore Sun reported. For more information about fracking, with opinions from all different sides, please see the page here from the Ohio Environmental Council. In addition, Chevron has posted some useful information, though bias is suspected.